No excuses. That, in a nutshell, is what Toronto Maple Leafs goalie James Reimer was suggesting after he and his team dropped a 3-1 home ice loss to the 27th place Florida Panthers at Air Canada Centre, writes Mike Brophy. That, in a nutshell, is what Toronto Maple Leafs goalie was suggesting after he and his team dropped a 3-1 home ice loss to the 27th place Florida Panthers at Air Canada Centre one night after they were beaten by the Penguins in Pittsburgh the night before. The normally subdued Reimer was quite candid following the loss to the Panthers. 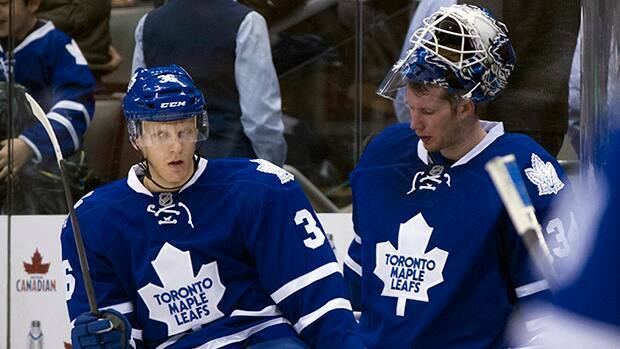 "Right now we're not putting together 60 minutes," Reimer said. "We either have half a team or a full team that doesn't show up for parts (of the game) and things go wrong and pucks go in your net and then you feel bad about yourself." The loss was Toronto's fifth game in seven nights and things don't get much easier moving forward. They host Phoenix Thursday, Detroit Saturday and then play the Rangers in New York Monday. Reimer, for one, was not about to use the schedule and fatigue as an excuse. Not to mention injuries and suspensions that have also dogged the team. "There's never an excuse ... there's never an excuse," Reimer said. "Injuries ... tired ... it's all B.S. Those are excuses and they are useless. What it comes down to is your will, heart and character. We should be able to win with half our guys out." Toronto coach Randy Carlyle believes his team was tired early in the game and that was one of the reasons why it fell behind as opposed to the night before in Pittsburgh when the Maple Leafs simply made mistakes. "I think fatigue seemed to play a part tonight more so than in last night's performance when I thought we started poorly because of mental issues," he said. "We started flat (Tuesday) and we just didn't have any energy to get involved and they won more puck battles than we did. All the 50-50 pucks that were available to us I would say they won the majority of them; specifically in the first two periods." The Maple Leafs out-shot the Panthers 29-23, but Carlyle doesn't believe that is an indication of any dominance over the opposition. "I think it was more one-and-out," he said. "I don't think we had a lot of second opportunities where we drove the middle lane, shot the puck and got a rebound and got another whack at it. It seems like we got one shot and they recovered the puck and went the other way on us. I think we were guilty of trying to be too cute. There were too many curls and drags versus putting their heads down and grinding the puck toward the net and maybe scoring an ugly goal. We tried to play shinny against and NHL hockey team." Defenceman Mark Faser admitted the Panthers were the underdogs in the game, but admired their determination and work ethic. "We weren't very sharp in the first period and that is a team that has nice jump right now," Fraser said. "They've had a little bit of a rejuvenation and they are a hard-working club. We just got out-worked early on." "We just have to stick to our system," Fraser said. "We have done it with it with a couple of the better teams in the league showing not only can we play to their level, but better. It is a matter of us out-working our opponents on a consistent basis." A giveaway by centre Nazem Kadri and an ill-timed pinch by defencemen Dion Phaneuf led to the Panthers opening a 1-0 lead at 3:29 of the first period on a shot by Tomas Fleishmann that, while we are assigning blame, goalie James Reimer failed to bail his teammates out on with a save. Phaneuf's attempt to get back was weak, too. Right-winger David Clarkson returned form a two-game suspension and made a quick impact in the game by taking a holding-the-stick penalty at 8:03 of the first period. No one can deny his passion and will to succeed, but his impact on the Maple Leafs after signing a seven-year contract last summer has been mostly negative. Toronto rookie Jerry D'Amigo took a couple of bone-crunching checks from the Penguins Robert Bortuzzo Monday in Pittsburgh, but there he was back in the lineup Tuesday against the Panthers. Toronto's leading scorer, Phil Kessel, was 5-5-10 against the Panthers in the last seven match-ups, but did not register a point Tuesday night. In fact, he was not a dominant player in a game where his team desperately needed his offensive. Toronto centre Nazem Kadri bowled over Florida goalie (and former Leaf) Scott Clemmensen in the third period, but was not penalized. Kadri was slapped with a two-game suspension for nailing Minnesota goalie Niklas Backstrom Nov. 13 in similar fashion.